Home >> Treatments >> WHAT IS OBSTRUCTIVE SLEEP APNEA (OSA)? Obstructive Sleeping Apnea (OSA) is such a problem that is faced by many but recognized by almost none. It is ironical how people continue to adjust to this Sleep Disorder so easily and yet manage to stay unaware of it. So here is all that you want to know about OSA or Obstructive Sleep Apnea. 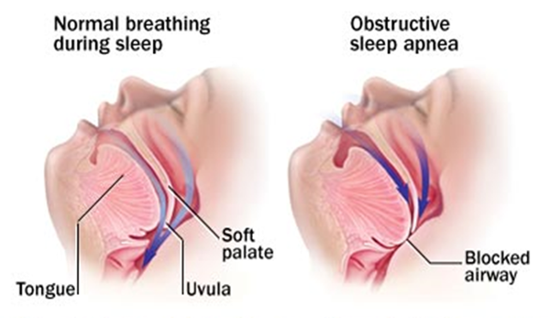 Swallowing of breath and stopping of the breathing actions temporarily while sleeping is the main phenomenon that indicates obstructive sleeping apnea. What happens in Sleep Apnea is when the eyes are shut; the breathing process gets harder because the diaphragm and the chest muscles work much harder so that the obstructed airway can open up to pass the air into lungs. This, in turn, reduces the flow of oxygen to the organs. Sometimes the breathing process might pause for sometimes and even might stop for fraction of seconds. Excessive Snoring while sleeping and unnecessary Teeth Grinding and sweating a lot while sleeping is the main things that are to be noticed. Even forgetfulness and depression are also some of the main symptoms for determining OSA. During the diagnosis, the doctor might ask you what your habits are while you sleep and might even ask you to sleep in the night for a night so that he can carry on his process of checking your sleeping habits. This process includes checking the air flow and breathing pattern, measuring blood oxygen level, checking the movement of eyes and the rhythm of the heart beat. After judging the following the doctor starts the treatment that includes change is general Sleeping Routines that include changing sleeping position (sleeping on your side), avoidance of alcohol and smoking, sleeping pills are also needed to be avoided because the pills tend to lengthen the process of non-breathing. Further nasal sprays are an important medicine which helps in getting relief from nasal congestions. However, CPAP machine which is a mask both for nose and mouth are also available to treat the extreme conditions of OSA. It is an air blower constant forces continuous air through the nose or mouth. The air pressure should be however only enough to restrict the tissues of the upper airway from collapsing while sleeping. Other devices are also available, which includes the BPAP, which has two different levels of flow of air that vary with breathing out or in. Surgical methods can also be used in case of extreme conditions. These surgeries include nasal surgeries, Mandibular or maxillary advancement surgery, Somnoplasty in which radio frequency energy is used or fixation of an upper airway stimulator. So one should be conscious of the disruption of their sleep and immediately consult a doctor for a better cure.